Book this exclusive tour to explore Stonehenge’s Inner Circle, which is typically off-limits to the public. Select a morning or evening tour when you book. Then, depart central London by comfortable, air-conditioned coach and begin your tour to the UNESCO World Heritage site of Stonehenge. Visitors who arrive at the site during main daylight hours are only allowed to stroll the perimeter pathway around the monument, a route roped off from the stone circle. However, this ‘private viewing’ tour lets your group enter the roped-off circle of stones to see the monolithic blocks at truly close quarters. Hear the fascinating facts and mysteries that surround the monument from your expert guide, and by enjoying the rarified atmosphere of the inner circle, experience the site at its magical best! With luck, and depending on the season, you may even visit during a sunrise or sunset, making the occasion extra special. See below for the morning or evening itinerary. Both tours conclude with a drop-off in central London. Morning Tour: After seeing Stonehenge, continue to nearby Lacock: a quaint village dating to the 13th century. Stretch your legs on a guided walk around the pretty lanes, and see some of the locations used in the movie Harry Potter and the Philosopher’s Stone, and TV adaptation of 18th-century writer Jane Austen’s Pride and Prejudice. Afterward, savor a hearty breakfast (own expense) at The George Inn, Lacock’s 14th-century pub, before venturing to the beautiful, UNESCO-listed city of Bath, famous for its Roman spa and Georgian architecture. Tour the well-preserved Roman Baths, built over natural hot springs; visit Bath Abbey, and learn about Jane Austen’s connections to the city. If you wish, follow your guide to see where 19th-century author, Charles Dickens, once lived, and call at a dairy to taste some local cheese. Alternatively, use some free time to perhaps shop for gifts or view Bath’s highlights on your own. Evening Tour: Leave London for Bath and visit the stunning Roman Baths and Bath Abbey, as set out in the morning itinerary. Then, drive on to postcard-worthy Lacock to amble around its historical streets. Later, sit down to dinner (own expense) at The George Inn, before journeying to Stonehenge for your ‘private viewing,’ after the daytime visitors have left. This tour was great. Our guide, David, was super-informative, very accommodating, and made sure everyone was satisfied. 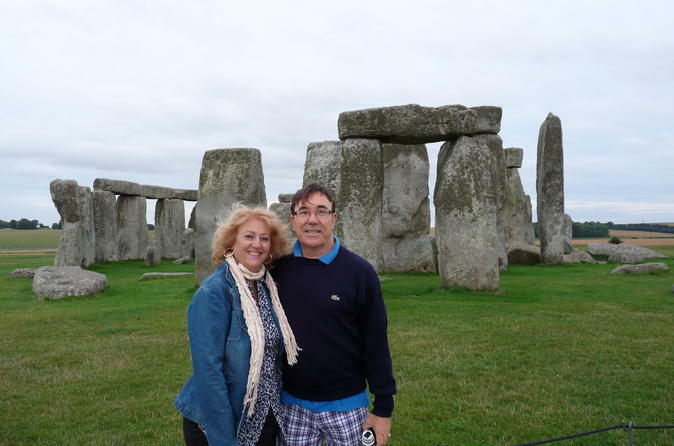 We had plenty of free time in Bath, a nice lunch at Lacock, and a semi-private tour of Stonehenge. Definitely worth the value. The guide and driver were excellent. Being able to go into the inner circle of Stonehenge is quite special. I would highly recommend this tour! Frank and Lamar were fantastic. Stonehenge at sunset was magical. I wish there was more time at Lacock. Wonderful experience and marvellous day and enjoyed the private tour of Stonehenge. Such an interesting visit and do informative. I am so happy I chose to take this trip! The tour guide (Frank) and driver (Clive) were fantastic and a great funny duo! At one point Clive had jumped on the mic while driving to talk to us. Great team! About the tour itself... Bath was amazing we had such a beautiful day to explore the city and see the bath itself. Very informative audio tours are included which was nice. Make sure you get out and actually explore bath! The town was easy to navigate and is really beautiful don't miss it! Stonehenge was phenomenal... I did not really know what to expect but I took the afternoon tour "sunset" booking time and I highly suggest it! To my surprise we had arrived and I found out that the site was closed but was open for private viewings. I was expecting more groups like mine to be out there and there weren't!! It was just us!!!! I was shocked! Our guide broke us up into two groups so it would be a more intimate group less crowd to actually go inside the site. It was absolutely phenomenal. I really can't speak enough about it. This was one of the best tours I've been on, the tour guide and driver we're excellent, very informative, and genuinely nice people. Going inside the circle was mind blowing!! Bath is a lovely place and Lacock a very cute English village. Our family totally enjoyed the trip. We have 3 kids age 10 to 15, and we all had a blast. Bath was really charming, and it would have been nice to have a little more time there. Stonehenge is breathtaking. Our guide Frank and driver Clive were super informative and kept us laughing all day! I just don’t think it does justice to Bath or the Cotswolds to cram this much into one day. If Imcould do it again I would spend a whole day in Bath and one in the Cotswolds. Stonehenge can be done easily in half a day. The guide was very good. Accessing the inner circle was amazing. I didnt mind that they broke the group in half as this allowed for better pictures and the time inside was sufficient to really get a feel for the scale of the site. The breakfast was good but I could have done with more time in bath instead. It was a little short and there wasnt enough time to take the whole audio tour. If Id planned better, Id have opted to stay and take a train back instead of the bus. Overall, well worth the money. It's a long day, but definitely worth it. I did the evening tour of Stonehenge, so the day started with a trip to Bath. Bath is rather interesting and enough to see and do to not just stay at the Roman Baths. I would think it would make more sense to of had lunch in Bath rather than Lacock which was really lunch/dinner depending how you look at it at about 4:30pm. There wasn't much to do in Lacock after eating in the pub. You also don't get a chance really to eat again after Lacock and don't return to London unitl after 11pm, so you might want to grab some food whilst in Bath or pack something before you go. However, the highlight is Stonehenge. It was magical to be able to go into the middle of the stone, and to be able to take photos as the sun is setting. The tour guide was great, very knowledgeable and very interesting. 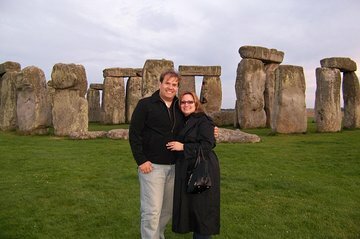 I think improvements can be made to the first part of the tour, but visiting Stonehenge easily outweighed everything else.